The Blue Devils needed sometime to break through, but once redshirt sophomore guard Rebecca Greenwell knocked down her second 3-pointer of the afternoon for a 25-21 lead, head coach Joanne P. McCallie’s squad began to run away with another win. Propelled by 23 points from Greenwell, No. 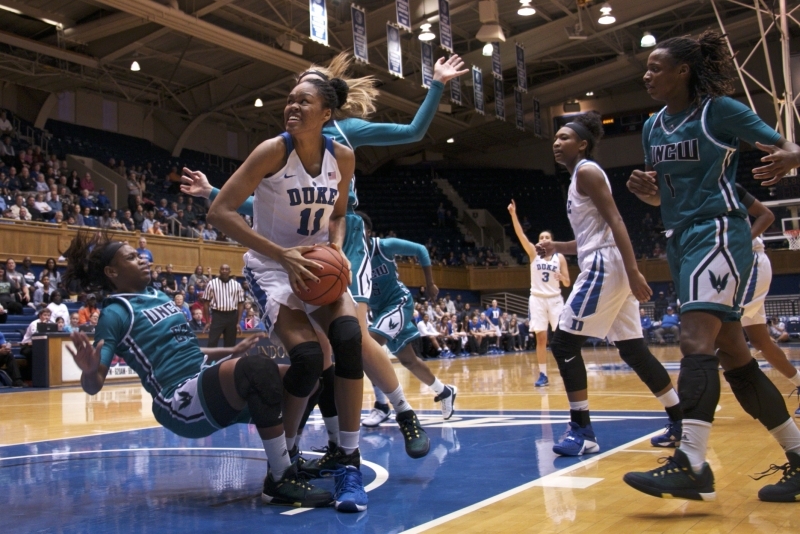 12 Duke defeated UNC Wilmington 78-56 on New Year’s Eve at Cameron Stadium. Seven Blue Devils scored at least six points in the nonconference finale, a wire-to-wire victory that sends Duke into 2016 and ACC play on a two-game winning streak. Sophomore Azurá Stevens battled foul trouble Thursday against the Seahawks but managed to score 11 points to extend her streak of double-digit performances to 28 straight games. UNC Wilmington whittled Duke’s lead to one twice, but a 16-3 run in the second quarter helped the Blue Devils head to the locker room with a 38-26 lead. After intermission, Duke (11-3) cemented its victory thanks to another 10-2 run in the third quarter. Greenwell posted 10 points to stake the Blue Devils to their halftime lead, with six of them coming from long-range. The Owensboro, Ky., native continued her sharp- shooting show in the final 20 minutes of the game, adding nine points from downtown. Greenwell came close to delivering her first double-double of the season, ending the game with nine rebounds. But like McCallie, Duke’s co-captain saw room for improvement after the Seahawks did not go away quietly. 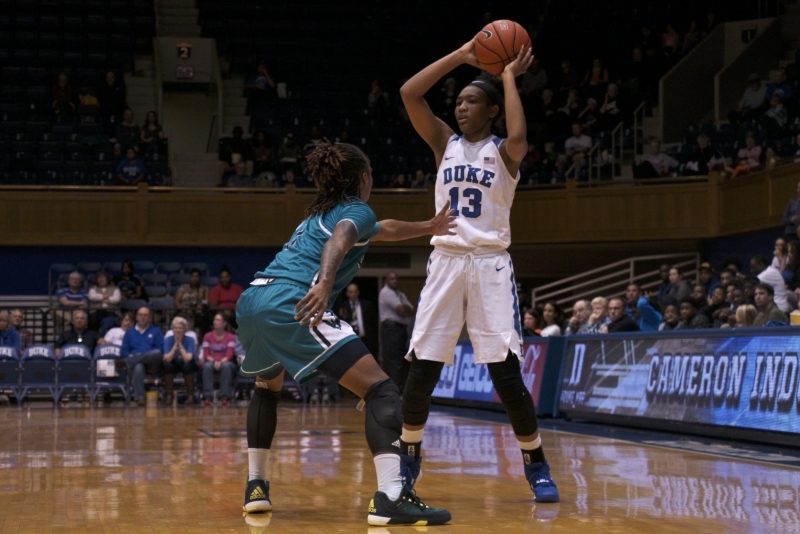 Freshman Crystal Primm scored nine points in Thursday’s win, one of seven Blue Devils to finish with at least six points. Sophomore Azurá Stevens—who entered Thursday’s game averaging 18.0 points per game—scored 11 points, extending her streak to 28 consecutive double-figure performances. Most of those points came after halftime as the Raleigh native was hampered by foul trouble for most of the afternoon, putting the streak in jeopardy. After surviving with four fouls, Stevens sat for the game’s final 4:56. Junior forward Oderah Chidom and freshman guard Crystal Primm combined for 10 points, with Primm making her second consecutive appearance as a starter. Freshmen Angela Salvadores and Haley Gorecki added 14 points off the bench. With her game-high six assists, Salvadores posted at least five feeds for the sixth time this season. With an average height of 6-foot-1, Duke held a significant height advantage, but UNC Wilmington (4-7) won the rebound battle 39-35, led by Rebekah Banks’ 10 boards. The Seahawks turned 20 offensive rebounds into 16 second-chance points, but the Blue Devils still outscored the visitors 44-28 in the paint thanks to continuous penetration and in-transition plays. Duke opens ACC action against Syracuse Sunday at the Carrier Dome in Syracuse, N.Y.